HEX Fleet Cross Body for iPad is a great tablet shoulder , big enough to fit both Apple MacBook Air 11’’ and Apple iPad or iPad 2 at the same time. Made from durable fabric material, which is coated with water-resistant layer, it will protect the electronic goodies inside from everyday bumps and bruises. 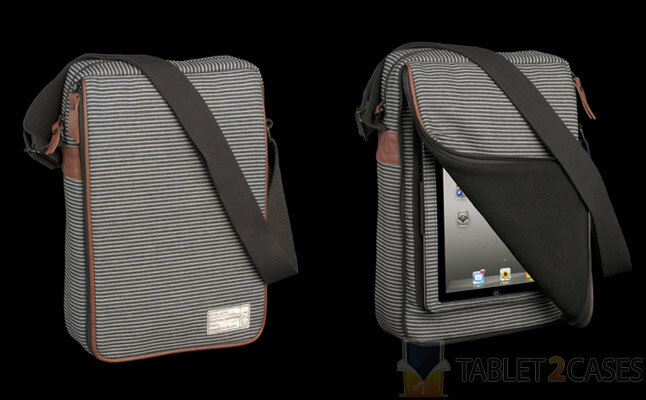 The new Apple iPad 2 case comes with a high quality zipper for main compartment and a proprietary “HEX PadPort” for the tablet. This clear polyethylene window allows quick and easy access to your device without the need to take it out of the case. The new Apple iPad case also features a comfy adjustable shoulder and a convenient organizer on the inside, which means several storage pockets, pen or pencil holder and credit card slots. The new tablet bag is not only highly functional offering great mobility to tablet owners, but is also classy and elegant. The price for this case is $59.95.